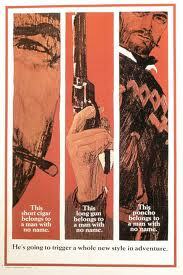 Is there any director from cinema’s past 50 years as influential as Sergio Leone? It’s impossible to even decide where to begin with the legacy he and his films have left behind. Of course, you could start with the incredibly prolific wave of 70’s Italian genre movies that followed in his wake; slasher films, cop films, supernatural thrillers, and the genre he godfathered - The Spaghetti Western. They are, almost without exception, derived from his wholly unique visual style. 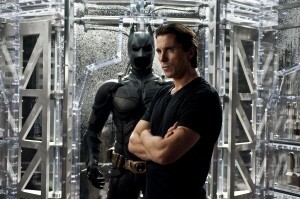 And his preference for ‘heroes’ who err on the side of violence and villainy. Then there is the sheer iconography of his greatest images – from the climactic duel in THE GOOD, THE BAD, AND THE UGLY and De Niro staring blankly into the end of ONCE UPON A TIME IN AMERICA, to his oft-used favorites like sweat-dripping close-ups crosscut with desolate long shots, or the use of the entire Cinemascope frame to photograph nothing more than a man’s eyes. This is to say nothing about the fact that he created one of cinema’s defining antiheroes (if not one of its first) in Clint Eastwood’s Man With No Name, a bounty killer who murdered without hesitation for money and spouted enough one-liners for us to like him while he did it. We’ve seen a few of these characters since then. And perhaps most importantly, there is the innumerable amount of modern filmmakers who count him among their influences – and none too subtly. And that list ranges from his spiritual son Quentin Tarantino to master filmmakers like Martin Scorsese to upstart youths like Edgar Wright (SHAUN OF THE DEAD.) So, to put it bluntly, imagining the landscape of modern film without the language and influence of Sergio Leone to guide it is a bit like trying to imagine what the NBA would be like without Michael Jordan. And with A FISTFUL OF DOLLARS, playing twice today at the Brattle Theatre, you get to see Leone become Leone, as we know him. 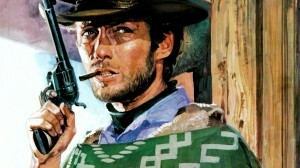 Ennio Morricone’s musical compositions are as integral to his style as any of his visual flourishes, and the pairing of his music against Leone’s ruthlessly violent images – like Clint Eastwood’s boot stomping into the picture, framed as large as his enemies entire bodies, ready to do battle – is like cinematic love at first sight. 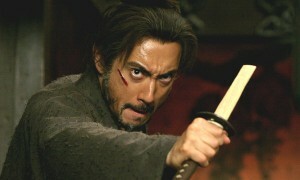 And while opening scenes feel a bit craftsman-like (Leone had worked behind the camera on sword-and-sandals epics) by the film’s climax, his eye has matured enough to capture the shockingly powerful frames of conflict and contrast that have captivated viewers so vehemently for decades. But Leone makes the movie his own, his signature is undeniable – and it’s those changes and images that would come to define the artist as we know him. The sense of self-awareness that penetrates throughout all the operatic posturing, making every single second a joy to watch. The sense of deconstructing his chosen genre, the western, then building it back up with nothing more than it’s most essential moments – a hero emerges, a villain conquers, a gunfight – stretched out to unbearably tense lengths. And those beautiful, magnificent zooms – everything that we now know as simply Leone is present here. So, behind the “it’s a remake!” complaints is one of the greatest instances of a filmmaker finding the precise voice he would use to tell stories for the rest of his career. 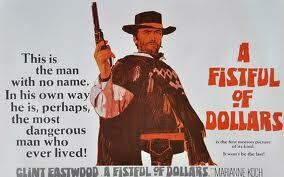 A FISTFUL OF DOLLARS screens today, 7/31, at 4:30PM and 9:30PM. 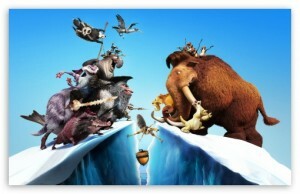 THE STORY OF FILM, PARTS 7 + 8, play at 7:00PM. The Brattle Theatre, 40 Brattle Street, Cambridge MA. 02138. “Kaige does a masterful job of pacing the story, weaving together the formative moments of the young man’s life to create a compelling and thoroughly entertaining cinematic experience. 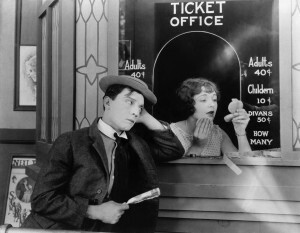 Following last week’s screening of Chaplin’s THE GOLD RUSH, the Brattle Theatre is screening Buster Keaton’s SHERLOCK JR. tonight and tomorrow as part of its repertory series based on the documentary, THE STORY OF FILM. As half of a double feature that covers the birth of cinema, SHERLOCK JR. is remarkably sophisticated. Clocking in at under an hour, our hero Keaton solves a mystery, falls into a movie, and must win back the hand of his love interest all before a fade to black. Its breakneck pace was standard for the era of short comedy features and one-reelers (around 20 minute shorts). The following year, Chaplin would release THE GOLD RUSH with a decadent 90 minutes in run time. However there’s no time for lulls in SHERLOCK JR., positioned from the start with jokes ready to set off a chain of events. Not a word is spoken (it’s a silent comedy), but it’s perfect this way. The audience gets to fill in what’s going on by context clues with the help of intertitles. It’s our own little mystery as a modern audiences unused to watching movies without dialogue. But Keaton is a different comedic craftsman than Chaplin. He never smiles. His listless expressions are up to the viewer to interpret. Chaplin overacts: he cries, he laughs, he flirts, and there is no confusion or subtly about it. Both were meticulous about the gags in their films. Chaplin would often fashion ordinary items into different devices, but Keaton would construct elaborate mechanical gags with camera tricks. He does this in SHERLOCK JR. when he falls into the silver screen and into the throws of a movie, an action-packed mystery. It’s akin to a reverse on the plot of Woody Allen’s PURPLE ROSE OF CAIRO, and Keaton’s reality becomes that of the movies. 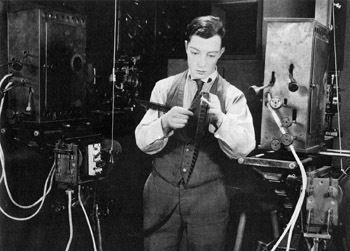 Not to ruin the scene-changing gag, but remember that this was 1924 and the only tools Keaton had at his disposal were surveyor’s tools and scissors for editing by hand. The scene’s flawless appearance gives the impression that he does all the traveling in the movie within the movie. The movement from location to location doesn’t waver, which is even more impressive when you realize that cameras were also hand-cranked at the time.